Bernie Ecclestone, President and CEO of Formula One, has provided his mug shot for a print advertising campaign by Swiss wach manufacturers Hublot. Ecclestone and his girlfriend Fabiana Flosi were robbed and the Formula One headquarters in London on November 24, forced to hand over $300,000 USD of watches and jewelry. 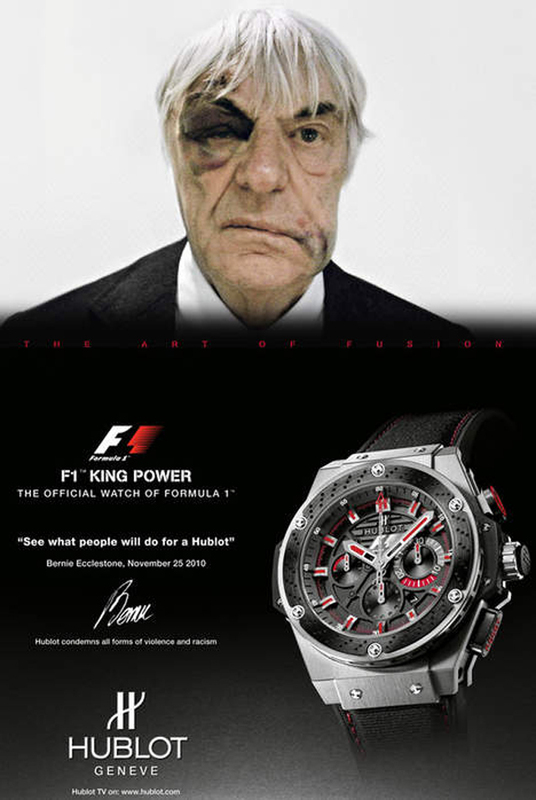 Ecclestone’s bruised face appears above a fairly ordinary promotion for the Hublot watch, with the phrase, “See what people will do for a Hublot”. The ad appeared in The Financial Times and the International Herald Tribune.